While I was in California and Nevada, visiting offspring, we ate at a Mexican restaurant on our way from San Luis Obispo, CA to Reno, NV. 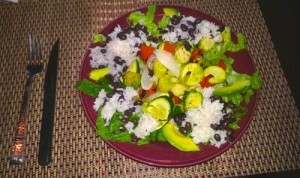 The dish was grilled veggies with rice and refried pinto beans. I liked the idea of the recipe more than the food itself because there were too many onions, the beans were pureed, and I think the rice may have been fried. When I was in Reno I remade the dish at my son’s and daughter-in-law’s and liked this version better: healthier & tastier. I hope you do, too. Thanx to son Ira and his wife, Samantha, for taking the photos. Utensils: Measuring cup, cutting board & knife, cooking pan, pot for rice, pot for beans, large serving plate. Romaine (organic) lettuce, washed and and cut into thin strips, crosswise. 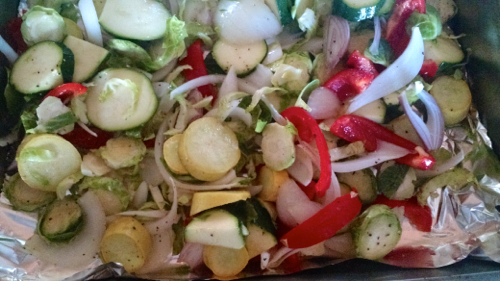 These are the veggies before putting in the oven, They do shrink, so 4-5 cups may yield only 3 cups when cooked; thus, don’t be afraid to use lots of good-for-you veggies. 4. In the meantime, while rice is cooking and veggies are baking, heat up black beans in a small sauce pan with enough liquid to avoid burning. (I generally soak black beans overnight and cook the next day, but when I was in Reno and did not have access to soaking beans in our hotel, I used my daughter-in-law’s organic black beans in a can.) Also, wash, dry and slice the Romaine lettuce into strips. 5. When the veggies are done, line the platter with the lettuce. Place cooked veggies in middle and rice and drained beans along the sides, with sliced avocado and/or olives in between rice & beans. Alternately, you can serve the rice and beans in separate bowls. Serve hot. Variations: Using tortillas, place a little of each of the food items in the center of the corn tortilla, fold two sides in and then roll tightly. Add grated jack cheese or other of your choice on top of the veggies. If you want the cheese to melt, add the cheese when the veggies are first taken from the oven and are still very hot. If you don’t want a wrap, you can also garnish the dish with baked corn chips for a crunchier taste or use a hard shell tortilla and fill it with veggies, rice & beans. Any way you make this, it’s still a celebration of The Good Taste of Health (my motto) for Cinco de Mayo. This entry was posted on Tuesday, May 5th, 2015 at 10:23 am	and is filed under Kitchen Nutrition. You can follow any responses to this entry through the RSS 2.0 feed. You can skip to the end and leave a response. Pinging is currently not allowed. because everything was fresh and organic when possible.